NASA’s Nuclear Spectroscopic Telescope Array, or NuSTAR, has captured these first, focused views of the supermassive black hole at the heart of our galaxy in high-energy X-ray light. Taken from wikipedia. Dr. Daniel Wik visited DTM this morning to give a talk about NASA’s NuSTAR mission, an X-ray telescope in low-Earth orbit designed to study some of the most exotic and energetic phenomena in the universe. 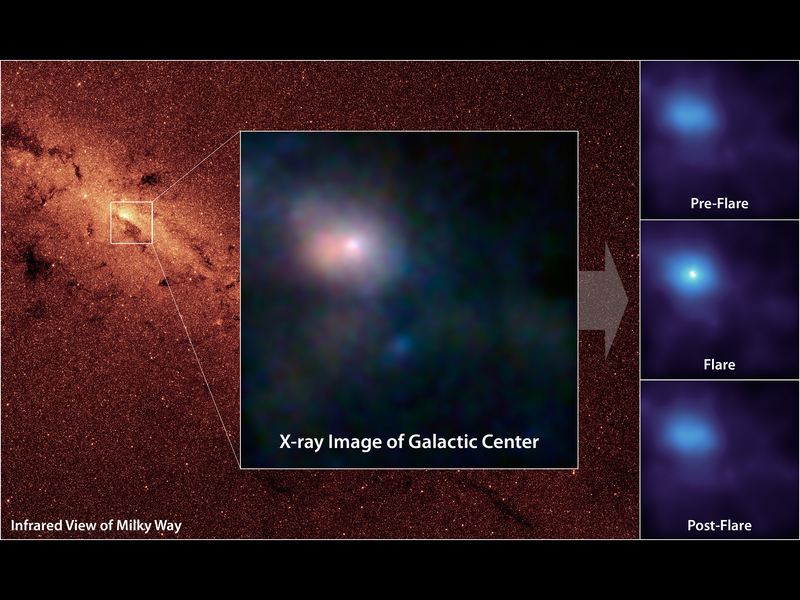 For example, the image at left shows observations taken by NuSTAR of the center of our galaxy. In recent years, astronomers have learned that a supermassive blackhole looms at the center of our galaxy, gobbling up gas. The images at left show a flare bursting from the galactic center, made of gas heated to 180 million degrees Fahrenheit (100 million degrees Celsius) as the black hole sucked material down into its deep, dark center.